This Old Pond comic was inspired by a presentation by Corey Davis (University of Victoria) “A Website on the Shelf: Libraries and the Challenges of Digital Preservation” at SHARP 2017 conference. When Basho needs inspiration to finish his haiku, he asks a frog to jump in the pond. But the frog just won’t do it. Will Basho be able to finish his Old Pond poem before sundown? Depends on the frog. This hilarious story, created during 24 Hour Comics Day in 2010, was revised and is now available in e-book format thanks to a grant from the Canada Council for the Arts. I’m working on my Haiku Life video: a short animation film about the childhood of Kaeru the haiku apprentice from my Old Pond Comics. Check out the cute tadpole! The final video will be unveiled on April 17 (National Haiku Day) on The Haiku Foundation website. The beginning of the year is a good time to look back at what you’ve accomplished in the previous year and make new plans for the new year. In 2014, I created 255 new posts. My readers came from 75 countries. Here’s a look at the most popular blog posts (the ones that got the most views) in 2014. I look forward to entertain you some more in 2015 with comics, but also with new columns such as Techno Tuesday (featuring Haiku and New Technology) every Tuesdays. 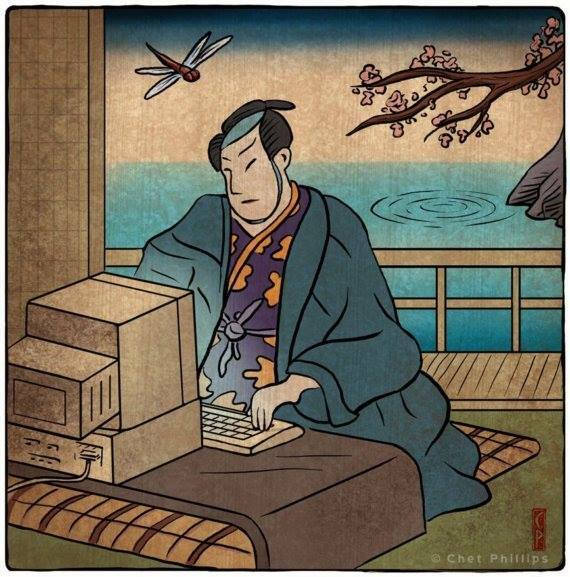 I’m starting a Techno Tuesday column in which I will share things I’ve found on the web and social media as a proof that haiku has really arrived to the 21st century. Here are some of my favorite tweets from Dec. 22-Dec 29 2014 by haiku poets Carlos Colon, Johnny Baranski, Johannes S. H. Bjerg and more! 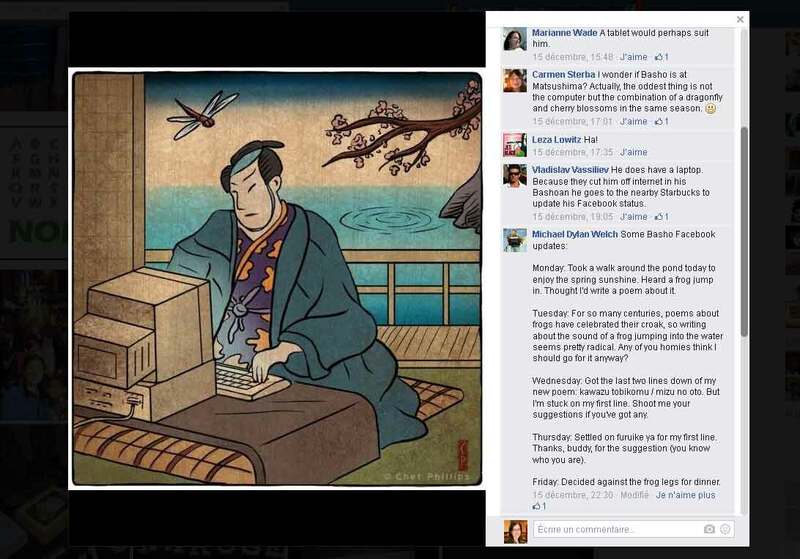 In this Techno Tuesday column, I share a hilarious Facebook post by Michael Dylan Welch. Monday: Took a walk around the pond today to enjoy the spring sunshine. Heard a frog jump in. Thought I’d write a poem about it. Tuesday: For so many centuries, poems about frogs have celebrated their croak, so writing about the sound of a frog jumping into the water seems pretty radical. Any of you homies think I should go for it anyway? Wednesday: Got the last two lines down of my new poem: kawazu tobikomu / mizu no oto. But I’m stuck on my first line. Shoot me your suggestions if you’ve got any. Thursday: Settled on furuike ya for my first line. Thanks, buddy, for the suggestion (you know who you are). Friday: Decided against the frog legs for dinner. Source: Michael Dylan Welch Facebook page.